Dr. Linda Bleicken brings more than 27 years of university leadership experience to her position as American Academic Leadership Institute President and offers insight into the challenges today’s leaders face on college campuses. Bleicken joined AALI after serving as the seventh president at Armstrong State University in Savannah, Georgia from July 2009 until her retirement in June 2017. During her tenure at Armstrong, Bleicken reaffirmed the university’s commitment to student success and launched the Armstrong Commitment Fund, which provides need-based gap funding to assist degree completion. She also launched initiatives that increased retention and graduation rates, with the highest gains among under-represented minority students. At Armstrong, Bleicken oversaw $100 million for new construction and renovation of existing buildings. She also secured state funding for the new $22 million Waters College of Health Professions building, which broke ground in August 2017, as well as the largest private gift in the institution’s history. Originally from Iowa, Bleicken previously served as Provost and Vice President for Academic Affairs at Georgia Southern University in Statesboro, Georgia. At Georgia Southern, she also served as the Vice President for Student Affairs and Enrollment Management, Associate Provost, Associate Dean of the College of Business Administration and Acting Chair of the Department of Management. 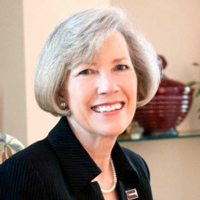 Over the years, she has served on numerous local and national boards, most recently completing terms on the board of the American Association of State Colleges and Universities and the NCAA Division II President’s Council. Bleicken earned a Ph.D. in Management, an M.S. in Management and a B.B.A. in Marketing from Georgia State University. She officially assumed her duties as President of the American Academic Leadership Institute on July 1, 2017.